There are many poisons and toxic plants in and around our homes or other environments (dog parks, hiking trails, etc) that are potential life-threatening hazards to our animal companions. It is impossible to list every poison or toxic plant, as some animals may respond adversely to non-toxic plants and substances. It is extremely important to be aware of what is known to be toxic or poisonous and to ensure that your animal companion does not have access to those substances or plants. Also, here in Las Vegas, there are poisonous insects, spiders, and snakes. The ASPCA has a list of non-toxic and toxic substances and plants on their website for quick reference. If you are unsure of the type of fauna or flora that is in or around your home, take a sample to your local nursery for identification. Make sure you ask for the common and scientific names. Exposure to a toxic substance includes ingestion or skin contact. Many substances can be absorbed through the skin, eyes, mucous membranes or pads, such as oils, grease, antifreeze, detergents, and other liquid substances. Treatment or decontamination will depend on the substance of exposure. 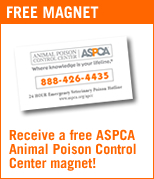 The ASPCA Animal Poison Control Center hotline operates 24 hours a day, 7 days a week, at (888) 426-4435. There is a $60 consultation fee, payable by credit card, for this service. This includes follow-up consultation should you or your vet need further assistance with your pet’s case. Click above to visit the ASPCA Animal Poison Control Center website and see a list of toxic plants, poisonous substances, and obtain other poison safety information. You can also get a free pet safety pack! !